More than 1,000 UK schools are using software that “forces” staff to spy on pupils as they work on their computers, privacy campaigners have warned. The programme can be used by schools to monitor pupils’ internet activities, but also access their web history, block certain websites and monitor what they are typing. The technology aims to protect children from grooming and stop them from accessing adult websites, the Daily Mail reported. In some cases, however, schools have installed the programme without making families aware, prompting concerns that the extreme level of monitoring and filtering online content may go “too far”. Figures obtained by civil liberties group Big Brother Watch show that of 1,420 secondary schools in England and Wales which provided data, 1,000 admitted to using the spying software. The schools have spent some £2.5m on the software, and installed it on a total of 832,386 computers, laptops and mobile devices. Of the 1,000 schools questioned, one in six were able to provide details of acceptable use policies, with just 26 able to give information about the type of software and how it was used. Of the schools contacted, 123 did not give any further detail beyond stating that students may be monitored when using technology in school. In its report, Big Brother Watch said that schools often consider buying the software in order to keep pupils safe online, or to protect them from potential radicalisation. But, campaigners added: “We are concerned that the use of technology which allows real time monitoring is placing teachers unwittingly in the position of being Big Brother. 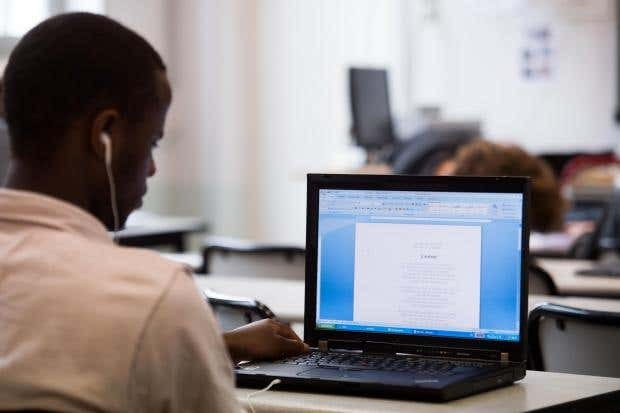 “Forcing staff to oversee their pupils’ every digital move represents a fundamental shift from the traditional method of overseeing pupils by engaging with them from the front of the class. “Schools currently offer little explanation about the use of the software in their acceptable use policies. The understanding that teachers are able to “spy” on pupil activity comes amid wider concerns raised over pupil data protection issues in schools. Big Brother Watch urged that use of the software in conjunction with school CCTV and biometric systems risks “normalising” children to surveillance. Malcolm Trobe, interim general secretary of the Association of School and College Leaders, said: “Computer monitoring software is used in schools to safeguard the welfare of children and young people by ensuring that they are not exposed to damaging online material.